Continuing his focus on job creation and promoting Florida as a premier tourism destination, Governor Rick Scott spent his 11th ‘Let’s Get to Work’ Day working as a park ranger at Hillsborough River State Park today. Governor Scott’s workday began at 7:30 this morning, where he worked alongside Florida Park Service Director Donald Forgione and Hillsborough River State Park staff to conduct landscaping maintenance and an archeological dig. Park staff routinely conducts archeological digs when new signs or structures are needed to ensure no cultural resources are damaged in the process. 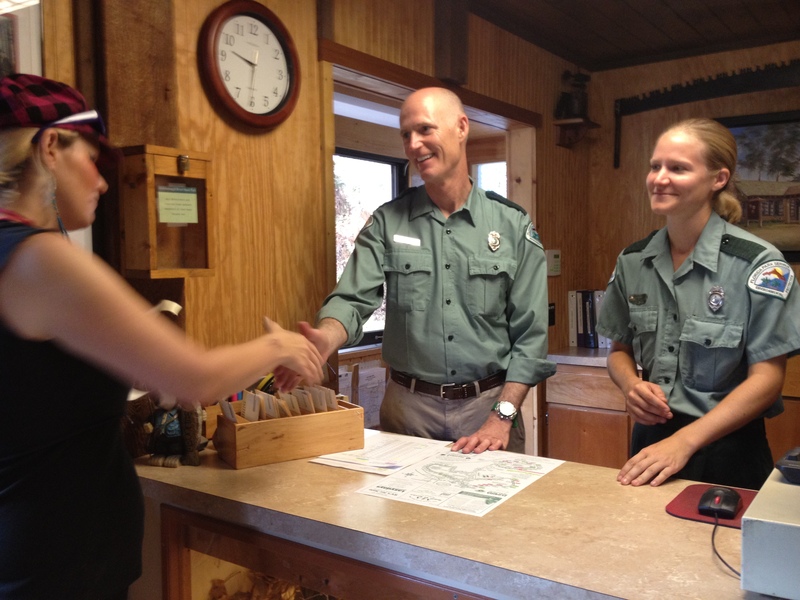 Governor Scott continued his workday by opening the ranger station and greeting visitors. Later, he checked on campers, ensuring guest safety by monitoring the pool area and working with a concessionaire to serve food and rent equipment to park visitors. In the afternoon, Governor Scott conducted a tour for park guests of the Fort Foster Historic Site with park rangers. Fort Foster is the only standing replica of a Second Seminole War Fort in the United States. Then, acting as the Chief of Piece, Governor Scott participated in a cannon firing demonstration, giving the command to fire the cannon and assisted with guest safety measures. Florida’s parks and trails boost the state’s economy, enhance property values, help attract new businesses and increase tourism. More than 20.4 million people visited Florida’s 160 state parks, contributing more than $950 million to Florida’s economy and generating more than 19,000 jobs during the 2010-2011 fiscal year. Spanning 700,000 acres and 100 miles of sandy white beach, the Florida Park Service is one of the largest in the country, offering year-round outdoor activities for all ages, including swimming and diving in Florida’s rivers and springs, birding, fishing, hiking and riding on natural scenic trails. Battle reenactments and Native American festivals celebrate Florida’s history, while art shows, museums and lighthouses offer a window into Florida’s cultural heritage. The goal of the Florida Park Service is to help create a sense of place by showing park visitors the best of Florida’s diverse natural and cultural sites. Florida’s state parks are managed and preserved for enjoyment by this and future generations through providing appropriate resource-based recreational opportunities, interpretation and education that help visitors connect to the Real Florida. Last year, Governor Scott started working at jobs that mirror the tasks he performed on his journey from public housing to the Governor’s Mansion. Floridians can suggest jobs for the Governor’s workdays by visiting www.FLGov.com and clicking on “’Let’s Get to Work Days’ or e-mailing Rick.Scott@eog.myflorida.com. Stay updated on the Governor’s ‘Let’s Get to Work’ Days by following him on Twitter and Facebook. Opened in 1938, Hillsborough River State Park is one of Florida’s first state parks; this original Civilian Conservation Corps (CCC) Park is divided by the swiftly flowing Hillsborough River with a set of Class II rapids. The river provides opportunities for fishing, canoeing, and kayaking; a canoe/kayak launch is available at parking lot #4. This concession provides breakfast & lunch, camping & picnic supplies, and a variety of memorable souvenirs. Ranger-led tours of Historic Fort Foster Site occur every Saturday. Hikers can walk over seven miles of nature trials: Rapids Trail, Baynard Trail, a sub-section of the Florida Trail and the Wetlands Restoration Trail. Visitors can also enjoy a refreshing swim in the park’s ADA accessible swimming pool. Governor Rick Scott, along with the Florida Department of Environmental Protection’s Florida Park Service and the Florida Recreation and Park Association, proclaimed July as Park and Recreation Month. Floridians and visitors alike are encouraged to spend time outdoors at one of Florida’s 171 managed lands, which include state parks, state trails and historic sites. The Florida Park Service launched a new web page highlighting some of the most unique and fun activities in state parks. The Get a little park on ya! website offers 50 fun things to do this summer in state parks. The nation’s best state parks and trails have joined forces. Now a part of the Department of Environmental Protection’s Florida Park Service, the award-winning Office of Greenways and Trails manages the 110-mile Marjorie Harris Carr Cross Florida Greenway, eight state trails and more. Florida’s award-winning state parks have inspired residents and visitors with recreation opportunities and scenic beauty that helps to strengthen families, educate children, expand local economies and foster community pride. With 160 parks, 700,000 acres, 100 miles of beaches and more than 600 miles of multi-use trails, visit soon and often to enjoy Florida’s natural treasures. For more information, visit www.FloridaStateParks.org or www.dep.state.fl.us/gwt/guide/.